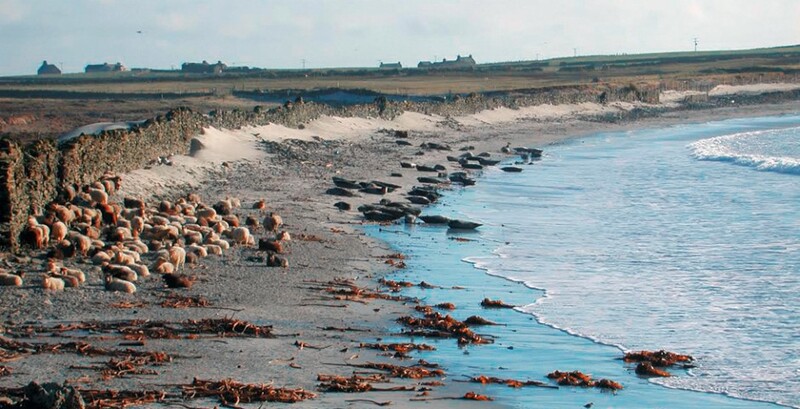 Since the completion of the work on the sheep dyke in 1832, the sheep have been confined to the shore and to a diet that is almost completely seaweed. 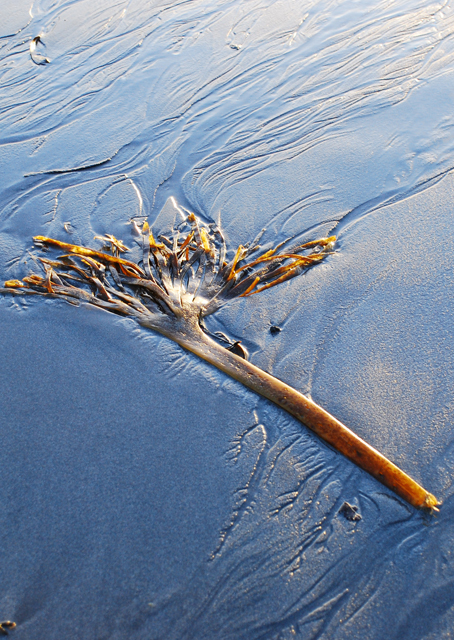 The main seaweed is laminaria, with long stalks or stipes that grip to rock with a holdfast, and leathery brown fronds that spread out in the water. Laminaria are commonly called kelp, and in older times were burned to make the valuable kelp ash that was sold for industry. In later years, the stipes or tangles were dried and ship away to factories extracting alginates – sugar-fibres used in the food and pharmaceutical industries. The waters around Orkney are rich in this type of seaweed. The kelp is lower down the shore, starting a little above low water mark and extending out into deeper water. Winter gales tear huge quantities from the sea bed and cast them up on the beaches, a bonanza for the sheep. The sheep are at their prime weight in December. At other times of the year, they have to maximise their opportunities to access the laminaria, and have become highly proficient in this. 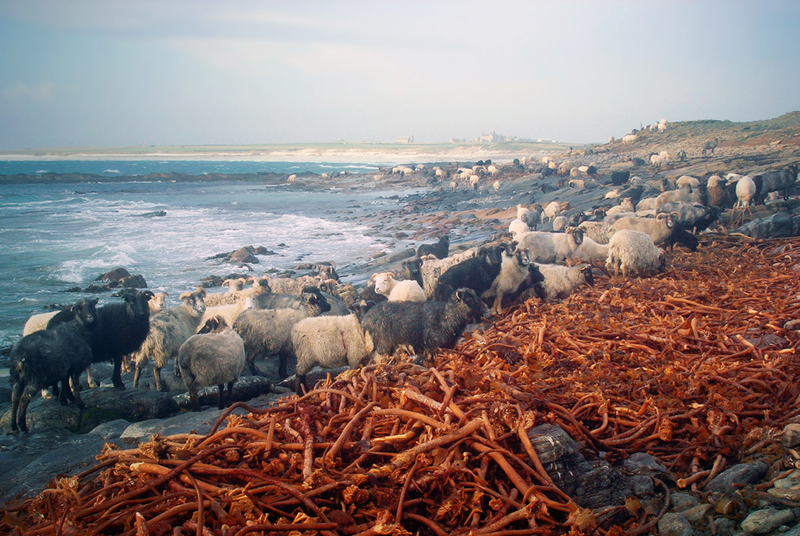 “Once the tide begins to ebb and leave a row of stranded seaweed at the high-water mark, the sound of the retreating wavelets acts as if it were a sheep’s alarm clock. Their spell of sleep, rest, and cud-chewing, which has lasted since about half-flood-tide, is over. Intermittent foraging then goes on until the next half-flood-tide signals the time for further rest and sleep. The seaweed is nutritious. North isles vet William Carstairs, for many years adviser to North Ronaldsay’s Sheep Court, had an analysis made which showed a protein level of 15%, and appreciable quantities of many trace elements including calcium, phosphorus, magnesium, sodium, potassium, copper, manganese, and zinc. The physiology of the sheep has changed to enable them to digest seaweed thoroughly and benefit from it to the fullest. While increased levels of salt in their diet does not harm the sheep (they drink from natural free water seepages and pools around the coast), a consequence of eating so much seaweed is that they do take in a large amount of iodine. The iodine adds to the taste of the meat, which is low in fat, since the sheep store fat around their internal organs. The meat is also rich in minerals from the seaweed. An energetic marketing drive from the island has seen the meat reach various top restaurants in London and elsewhere, as a delicacy for connoisseurs. It is also on the menu at several leading Orkney restaurants and hotels, and available through outlets in Orkney and online. Advice for preparing it is to cook it very slowly. The sheep are free to move around the shore but have their own preferences.